“She seeketh wool, and flax, and worketh willingly with her hands”. Prov. 31:13. Joyce always says, “God has blessed me with the gifts of knitting and crochet”, and these are gifts she enjoy sharing with others. Joyce lives in Los Angeles, CA. Joyce is a very skillful knitter, crocheter, designer and teacher who has won many awards. She designs for yarn companies and has seen many of her designs and articles published in national magazines. Her most recent designs were featured on the front cover of TKGA's Fall 2001 Cast On Magazine. 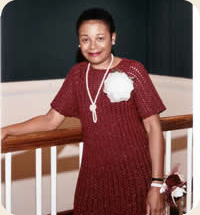 Two of her children sweaters were published in National Magazines. Two of her children sweaters were published by XRX, Inc. in the "Kids, Kids, Kids" book. Joyce teaches knitting and crochet at the The L.A. Stitchers and JoAnn's Fabric Store in Torrance, CA. She has taught many workshops and classes for West Coast knitting/crochet guilds, TKGA, CGOA, and Crochet Renaissance. Joyce's favorite knitting books are by Barbara Walkers and Elizabeth Zimmerman. CGOA (Crochet Guild of America), TKGA (The Knitting Guild Assoc. ), TNNA (The National Needlearts Assoc. ), honorary member of the Slipt Stitchers Knitting Guild in El Segundo, CA.